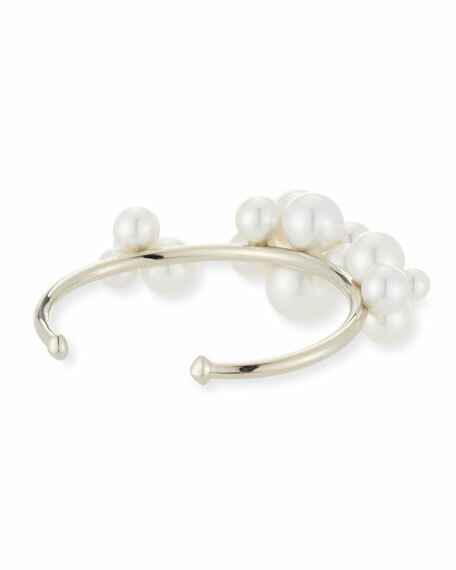 Bubble cluster bangle by Sean Gilson for Assael. Naturally colored, South Sea cultured pearls, 10.3-12.3mm. Salvador Assael's love affair with pearls began in 1950. At that time, he was conducting business in Japan and was frequently paid in pearls. By 1972, he had taken over the family gemstone business from his father, James Assael, and focused primarily on South Sea and Tahitian Pearls. Over time, Salvador became known as "The Pearl King" by selling the biggest South Sea Pearl strands in the world. To this day, Assael's White South Sea and Black Tahitian Pearls are considered the most desirable, without enhancements or treatments. For in-store inquiries, use sku #2461274.